If you are like me, you purchase several berry containers every week. I have been collecting empty clear containers for a while now, thinking of ways to use or transform them. Here are ten ways to recycle them. 1. Three-dimensional photo blocks. If you would love to give little ones the opportunity to manipulate and admire pictures, but are afraid they will damage them with their little hands, here is the solution. 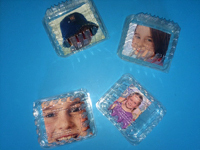 Glue each picture inside the lid of a berry container. Close the containers and set them upside down on the table or floor to give pictures a three-dimensional look. Children will enjoy admiring the pictures through the clear plastic and they will remain unharmed. 2. Insect observatories. 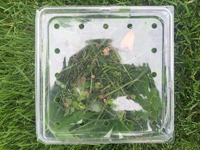 Of course, empty margarine containers with pierced lids can be used to capture insects, but empty berry containers represent a great way to observe captured insects without having to remove lids. Not only are berry containers clear, they already contain holes that will let air in to keep little critters alive and well. Although ants will easily be able to escape, by depositing grass, leaves, or tiny branches on the bottom of the containers, children will have time to admire the insects they find before they find their way out of their temporary home. Remind children that capturing new insects is what makes this activity fun. Personally, I especially love to use berry containers to capture and admire butterflies momentarily before watching them fly away. 3. Dice rolling tool. A clear berry container is great for helping little hands roll dice. Simply insert your dice, close the lid, and let children shake the container. When they are ready, they can deposit the container on the table or floor and look through the plastic to count the dots on each die. The dice can't fall out and what's more, they produce a fun, maracas-like sound as they bang against the plastic. Most of all, you will no longer have to search for runaway dice. 4. Waterfalls. On a hot summer day, add a few empty berry containers to your kiddie pool. Show children how they can press the containers in the water and then delicately lift them to create pretty waterfalls or fun watering cans. The containers will empty very quickly, but children will want to start over again and again. This activity is fun and refreshing! 5. Lunch boxes. We all know that we eat with our eyes. During summer months, snacks and lunches are often served outdoors. 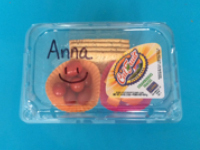 Why not deposit each child's snack or lunch in a clean berry container? Little ones will love seeing what they will be eating. 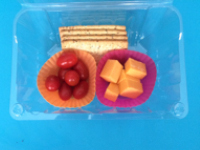 You can, among other things, add cookies, a sandwich, veggies, apple slices, or dry cereal to each child's clear lunch box. Write children's names on their container and distribute them. The containers will make snacks and lunches easy to transport outside and individual portions can be prepared ahead of time. 6. Bird feeder. Birds amaze little ones. Why not invite them into your yard to give your group the opportunity to observe them? Purchase bird seed at your local dollar store. Use a plastic knife to spread peanut butter over the openings along the bottom of a berry container and pour the seeds inside. 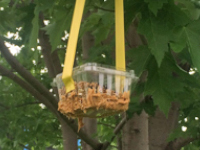 Glue pretty ribbon on either side of the container, hang your simple bird feeder from a tree branch, and watch out for flying visitors. Note: Bird seed and peanut butter should be manipulated by an adult to avoid possible allergic reactions. 7. Lightweight blocks. Create blocks that little hands will enjoy manipulating due to the pretty colors inside. Children can help you prepare these blocks too. You can, for example, cut strips of colourful felt, crumple pieces of bright tissue paper, or cut different colors of drinking straws, etc. Use the items to fill your berry containers and make lightweight blocks children will enjoy stacking. 8. Flower pots. Clear berry containers represent interesting tools when exploring a flower or plant theme with your group. Fill them with dirt and plant seeds with children. After a while, they will see roots growing through the clear plastic. What's more, when they water their flowers or plants, they will see if the dirt is wet only at the surface or all the way down to the roots. If you leave your flower pots outside, imagine children's surprise if they see a worm or insect crawling around their plants' roots. 9. Drawer dividers. Take advantage of a rainy day to clean out your arts & crafts drawers. This can actually represent a great sorting exercise. Simply empty one drawer at a time. Arrange empty berry containers inside each drawer and determine the characteristics of the items each container shall hold (color, use, size, etc.). 10. Pencil or marker case. The transparency of berry containers makes them great pencil or marker cases. 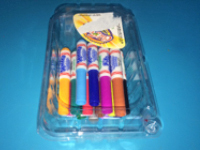 When they are deposited on your arts and crafts table, children can easily see the colors through the plastic and therefore quickly find the pencil or marker they wish to use. I am sure you will love reusing berry containers as much as I do! 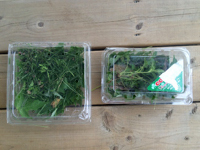 Pay close attention and be sure to discard any cracked or damaged containers to avoid cuts.